These Jet Pump Motors Feature A NEMA 56C Face Mount. Capacitor start motors have UL 1081 design with high service factors. Carbon keyed and 303 stainless steel shaft. 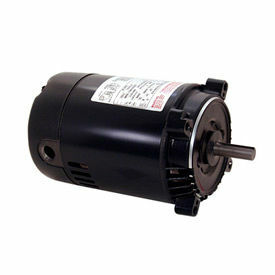 Jet pump motors feature reversible CCW pump end rotation. 40°C ambient temperature. Continuous duty, single phase motors have automatic overload protection and open drip-proof enclosure. Internally mounted capacitor. Sealed switch design. Provides up to 3450 RPM. 60 Hz.